Let me introduce you to 50s Diner Baguio. It’s a vintage themed restaurant located in the heights of Baguio City, Philippines. The place serves delectable meals in large servings (American size) and boasts of a cozy classic Hollywood theme from inside and out. I had to write about it, I just had to. 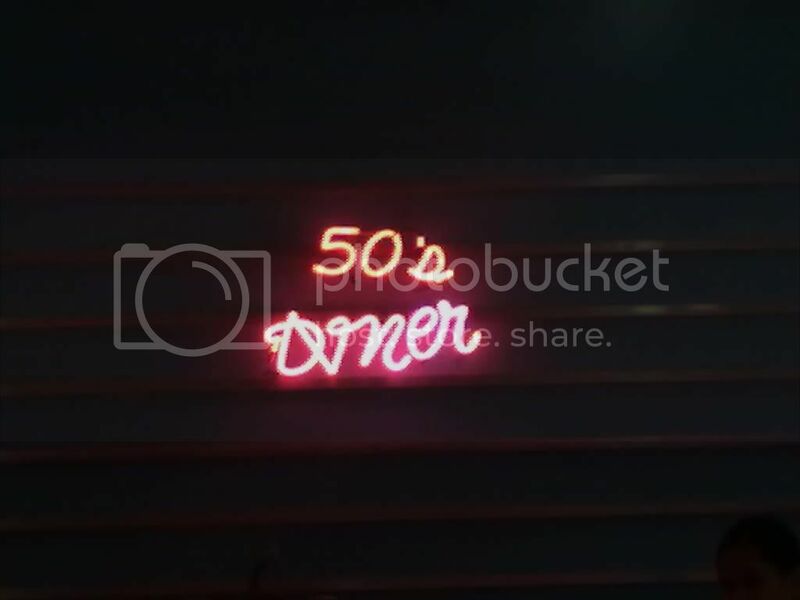 That Photobucket thumbnail generated for Manila Ocean Park was amazing so I wanted to create one for my album of 50’s Diner photos. The album has a great following, to my surprise since it was first posted. The album is nothing fascinating. I just wanted to capture the beauty of the place in film at least once in contrast to the countless number of times I’ve been there. It’s in fact my favorite restaurant. I simply love the place as a whole, even when it’s pitted against the more popular restaurants in Metro Manila. 50's Diner welcomes you with a cozy ambiance. It’s warm enough against the cold weather up in Baguio City, the Philippines’ coldest city. You’ll be greeted by lovely ladies in sailor uniform offering a seat. In case there’s none, you will be lead to a waiting area instead. I’ve waited for my turn almost every time I was there. You can’t imagine how many people; both residents and tourists alike frequent the place. I don’t have a list of the menu but I often order the same combination every time. I’m not a fan of burgers and club house sandwiches. I’d go for a complete meal of chicken, spaghetti, fries, chicken macaroni salad, mashed potato and/or other side dishes; never forgetting an ice cream shake or a fruit shake to go with the meal. Whichever meal you order, expect large servings you can’t eat alone. So I often intentionally skip meals before I dine here, just to make sure I don’t have leftovers. Mama's kid (image above) is 50s Diner Baguio's best seller. 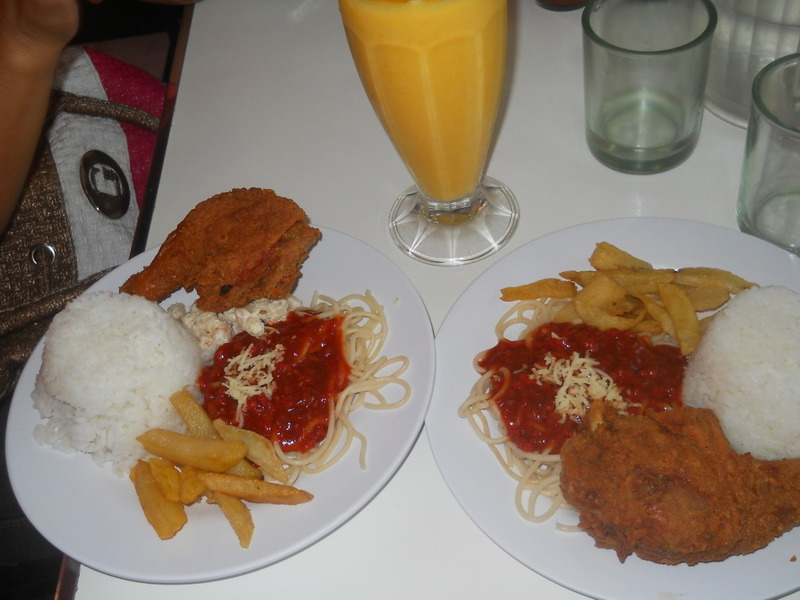 Single menu food prices start at ₱65 up to ₱230. Food for two and group meals prices vary. Aside from the gigantic meals, you sure won’t take your eyes off the walls. Whether you’re a fan of classic Hollywood films and stars, you will appreciate movie and celebrity posters spread all over the wall. You’ll find Humphrey Bogart, Audrey Hepburn, Ingrid Bergman, James Dean, and the blonde bombshell herself, Marilyn Monroe, just to name a few. There are also music icons of the oldies such as the Beatles, Nat King Cole, and the King, Elvis Prestley. Movie posters of classic films Casablanca, Attack of the 50 Feet Woman, Hollywood Diner, and Psycho, to mention some are also present. Images and paintings of vintage cars and equipment are also on display. There’s even one of those old jukeboxes our grandparents used to play music with. It’s no longer working but its presence there is reminiscent of the old days. Outside the restaurant, you’ll also notice the owner’s red vintage sports car and his famous Chao Chao dog. The location is also easy to spot as you’d pass by it on the way to Mines View Park, where breathtaking scenery of the mountains, hills, and houses below the city heights can be seen; not to mention the seemingly endless pit below. It’s of course not endless and you’ll see residential structures at the bottom. I wonder how they manage to built houses down there and how residents ascend to the heights where the park is. There are countless things to write about Baguio City, but this post is for 50’s Diner. It’s exact location? See details below with Google Maps info included. You can also check the actual 50's Diner Google Maps page so it's easier to locate it based on other landmarks. Having been able to drop by and dine at 50’s Diner numerous times, there are all too many memories I could write about. The photos I’ve captured on film (digital film, that is) are not enough to describe my thoughts. All I know is that I will surely be back to 50s Diner Baguio whenever I can. Haven't been to Baguio for more than 10 years already. I hope I could go there soon. ^If you'd visit it today, you'd be surprised by how much the place have changed, for better or for worse. last time I ate there was 16 years ago..can't remember too much..
You mean 50's Diner is that old? Wow!